"It was one of those games you never really forget. The day Cameroon introduced a different way to play football." Barry Davies recalls instantly the night Milan's revamped and futuristic San Siro stadium opened its doors and welcomed the world. The first game of the 1990 World Cup has its own place in football infamy. Argentina, the reigning world champions, were toppled by Cameroon in one of the tournament's great shocks, the Africans finishing with nine men in an ill-tempered affair. In between commentating for the BBC on Andre Kana-Biyik and Benjamin Massing getting sent off, Davies also saw Francois Omam-Biyik score the game's only goal as Cameroon's tactics - kick Diego Maradona and Claudio Caniggia at every opportunity - prevailed. The game, like the stadium, became iconic, but the quality of the play was out of keeping with the magnificent setting. Milan was on top of the world at the time, almost literally in AC's case given they won the Intercontinental Cup in 1989 and would do so again later in 1990, having beaten Benfica a fortnight before the World Cup began to secure their fourth European Cup. It was the home of football and some of the greatest players the game has ever known played there; Paolo Maldini, Franco Baresi and Marco van Basten for Milan. Giuseppe Bergomi, Walter Zenga and, later, the Brazilian Ronaldo at Inter. 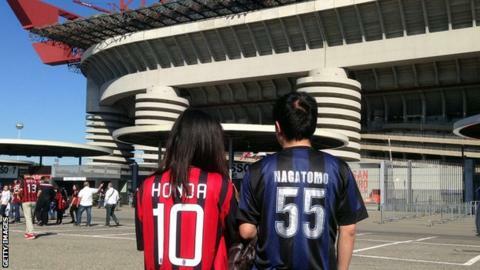 When the San Siro hosts the Milan derby on Sunday, it will feel like the game modern football left behind. AC and Inter Milan have both won 18 Serie A titles. Between them they have also won 15 major European trophies and 12 Coppa Italias. In 2011, AC Milan were seventh in the Deloitte Rich List. Inter were one place behind. It is fair to say they have not done particularly well since. The last time either finished in the top three in Serie A was 2012-13, which is also the last time they both played European football in the same season. Never before has four years elapsed without those things happening. In the past five seasons, AC Milan have had six managers. Inter have had five, sacking Frank de Boer and Stefano Piolo last season after 14 and 27 matches respectively. Milan have already lost three times in seven league games this season. They are seventh, four places behind Inter, who are doing much better than last season, when they were the ones in seventh. AC Milan are now 16th in the Deloitte Rich List. Inter are 19th. AC Milan's overall revenue went down 16% between 2010 and 2016. Inter fared even worse, with a 27% fall in turnover. During that same period, Manchester United increased their commercial revenue by 234%. The equivalent increase for AC Milan was 45%. Inter's just 4%. Italian football journalist Luca Taidelli says: "In 2010, when Inter won everything, they barely sold a cup in extra merchandise. There was no additional income. They didn't have a sophisticated commercial arm to take advantage of what the team did. "At the stadium they also have this ridiculous situation where official shirts are being sold in the shop for 120 euros, yet directly outside fake ones are being sold for 20 or 30 euros. I can't imagine this happening anywhere else." That reduction in turnover has impacted on the players both clubs have been able to buy. Prior to the most recent transfer window, when they embarked on an ambitious £200m spending spree and bought Leonardo Bonucci from Juventus for £35.1m and Andre Silva from FC Porto for £33.6m, AC Milan had not spent £30m on a player since Filippo Inzaghi joined them from Juventus in 2002. Inter have spent more than £25m on two players in the past three summers, their biggest outlay being on Joao Mario, who cost £35.7m from Sporting Lisbon. By contrast, Juventus, who have won six successive titles, played in two of the past three Champions League finals and are 10th on the Deloitte Money List, have spent in excess of £35m on three players in the past three seasons, including an Italian record £75.3m to Napoli for Argentina striker Gonzalo Higuain. The problem of fake merchandise being sold right outside the stadium is far from the only issue caused by the San Siro's complex business structure. In the immediate aftermath of Sunday's game, a laborious and familiar routine will get under way. The blue light bulbs at the entrance to the hospitality area will be changed. Pictures of prominent moments and figures from Inter Milan's history will be taken down. Blue covers will be taken off the executive seats. The walls will be cleared and everything put in storage. Then, the AC Milan garb is put out. The whole process takes hours. Meetings about the council owned facility take a familiar course. If improvements are required legally, to upgrade the toilets for instance, the three representatives from Inter and their three AC Milan counterparts on the board of the organisation that runs the stadium reach agreement relatively quickly. However, if general improvements are proposed, such as increasing the number of toilets, the decision gets mired in politics. Stadium sponsorship can only be agreed if it does not conflict with the interests of either club. There are red seats and there are blue. But there are also green, yellow and orange. As someone with close connections to the stadium said: "It is a spiritual home but, for fans of both clubs, it is not their stadium. They do not own it." There was a time when both Milan clubs were synonymous with the people who owned them. Media mogul and former Italian Prime Minister Silvio Berlusconi owned AC Milan from 1996 to April 2017. Billionaire businessman Massimo Moratti was Inter chairman from 1995 to 2013. Both spent huge sums turning their respective clubs into European champions. Carlo Ancelotti coached Milan to Champions League success in 2003 and 2007. Jose Mourinho led Inter to European glory in 2010, when they became the first Italian side to win the treble. The success has gone - and so too are Berlusconi and Moratti. Both Milan clubs are now under Chinese ownership. Li Yonghong's Rossoneri Sport Group paid £628m to buy AC Milan in April 2017. In June 2016, retail group Suning bought a 68.55% stake in Inter in a £590m deal. Suning have invested - heavily - in the Inter squad but they also have a long-term vision that revolved around redeveloping the San Siro. Their plan is to reduce the capacity from its current 80,000, the fifth biggest club ground in Europe, to around 55,000 and use the spare space to massively improve the stadium's corporate facilities. Rossoneri Sport seem to have been more interested in spending money on their team. However, those with detailed knowledge of Chinese investment in football overseas view Rossoneri, by buying Berlusconi's club, as having delivered on President Xi's demand to either open doors to key decision makers in western Europe or generate greater wealth to be used at home. It is not thought Suning have fulfilled either demand. Indeed, in August, they were accused by Chinese state media of using their investment in Inter to 'launder' money. Suning denied this was the case. However, the allegation is being interpreted as the Chinese government sending out a warning that unless Suning start to comply with President Xi's decree, they could find their ability to do business severely curtailed. Professor Simon Chadwick, a business of sport specialist at the University of Salford and expert in Chinese football affairs, said: "When it comes to football, listen out for who speaks first and look out for what they do. "What Suning are now expected to be doing is generating a positive financial gain for the Chinese state and demonstrate that it is repatriating those funds. Otherwise, it needs to start connecting into Milan, to major trade and infrastructure projects. "This is why I think AC Milan is particularly important. If you want to get anything done in Italy, Berlusconi knows who to talk to. Essentially, in buying AC Milan, the Chinese were not just buying a football club. They were buying their way into the economic and political heartland of Italy." It is impossible to imagine Chinese investment in AC or Inter Milan not being subject to some kind of central scrutiny in Beijing. But instead of wholly separate entities, what if they were - albeit loosely - tied together in some way? It is interesting to note that whilst Suning were not particularly interested in going through Inter's finances in acute detail when they negotiated their takeover, they were keen on knowing who owned the land that surrounds the San Siro. Last week, a statement from the Mayor's office in Milan revealed he had reached an agreement with both clubs that they were willing to invest in stadium redevelopment. As tends to be the case, details are sketchy and enthusiasm for such plans will always be limited by the fact the stadium, and its surrounding area, is centrally owned. Should that change, the entire area could be transformed. If Inter and AC, instead of working against each other in their own interests, were able to put on a united front, how much pressure could be exerted on the local government? Even at the clubs themselves, there is a sense of not being entirely sure why Chinese investment should be so heavy in two famous clubs from the same city, which just happens to be the financial capital of the ninth richest country in the world. In the short to medium term, major changes are anticipated within Milanese football, and the true nature of China's involvement there will start to become apparent. For now though, Sunday's derby remains a meeting between two of Europe's best known clubs, who appear to have little chance of actually winning anything.